THIMPU, Bhutan, September 9, 2011 (ENS) – Hydropower, the biggest economic driver in the Himalayan country of Bhutan, is threatened by serious water shortages as the country’s glaciers melt due to climate warming, finds Bhutan’s latest National Human Development Report. “Alternative development pathways, such as Gross National Happiness that we are promulgating, will influence the capacity of communities … to adapt to climate change,” said Pema Gyamtsho, minister of agriculture and forests, at the report’s launch last week. Gross National Happiness is the official development philosophy of Bhutan, a kingdom led by King Jigme Singye Wangchuk. It has been approved by parliament, making Bhutan the world’s only country to measure its wellbeing by Gross National Happiness instead of Gross National Product. To realize its Gross National Happiness philosophy of life, Bhutan has prioritized conservation of the environment, and made a commitment to remain carbon neutral by keeping absorption of the greenhouse gases higher than emissions. More than 70 percent of Bhutan is covered with forests. With an export ban on unprocessed timber, Bhutan has been able to keep its carbon absorption from the agriculture, energy and industry sectors at levels that maintain its status as a net sink for greenhouse gases. Yet as the climate continues to warm, melting Himalayan glaciers are theatening not only the happiness but also the lives of Bhutan residents. Depleted glaciers will leave little water for Bhutanese hydropower, but as they melt, catastrophic amounts of water will be released. As glaciers move across the landscape, they pile up rocky debris, forming moraines that act as natural dams for lakes filled with melt water. When they fail, they can create devastating glacial outburst floods. On October 7, 1994, in the Bhutan Himalaya, the partial collapse of a moraine along the edge of the Luggye Lake released a glacial outburst flood that killed 21 people and swept away livestock, crops, and homes. 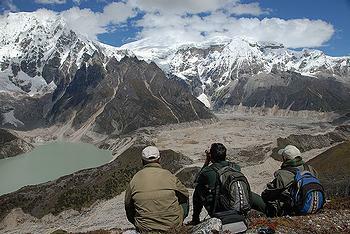 Luggye is not the only dangerous glacier in the region. 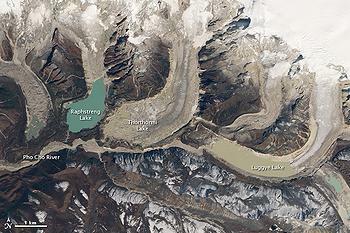 Officials are also concerned about the nearby Thorthormi Glacier Lake and the unstable moraine separating it from Raphstreng Lake, to the west. An outburst flood from Thorthormi into Raphstreng could cause the lower lake to overflow as well. The combined outpouring of meltwater and rock debris could be even more devastating than the 1994 disaster. To reduce the likelihood of a glacial outburst flood, Bhutan has begun a project to lower the water levels of both glacial lakes. “Resources are needed quickly given the long-term nature of adaptation initiatives and the short-term prospect of climate-related consequences,” said Ajay Chhibber, assistant administrator of the UN Development Programme. “The financing requirements for climate change adaptation and mitigation are considerable for a landlocked, least developed country such as Bhutan,” said Chhibber. A collaboration between the Gross National Happiness Commission Secretariat on behalf of the Royal Government of Bhutan and the UN Development Programme, the report resulted from consultations with national institutions, civil society organizations and development partner agencies. The report recommends that Bhutan increase its resilience to climate change by integrating climate policies, strategies and action plans into national poverty reduction strategies and development plans. The report calls for “green development” and for exercising further control over potentially harmful activities, such as logging, mining, mass tourism and the use of pesticides. It also recommends establishing baseline climate information and data and improvements in collection and analysis of research. The report advises expansion of ongoing climate financing mechanisms, warning that building resilience to changing weather patterns and melting glaciers is key to the one quarter of Bhutan’s population who live in poverty, dependent on subsistence farming and local natural resources.